Pace layers provide many-leveled corrective, stabilizing feedback throughout the system. It is in the contradictions between these layers that civilization finds its surest health. I propose six significant levels of pace and size in a robust and adaptable civilization. "Civilizations with long nows look after things better," says Brian Eno. "In those places you feel a very strong but flexible structure which is built to absorb shocks and in fact incorporate them." Eno offered this statement in an email exchange with Brand. You can imagine how such a process could evolve—all civilizations suffer shocks; only the ones that absorb the shocks survive. That still doesn't explain the mechanism. In recent years a few scientists (such as R. V. O'Neill and C. S. Holling) have been probing the same issue in ecological systems: how do they manage change, how do they absorb and incorporate shocks? The answer appears to lie in the relationship between components in a system that have different change-rates and different scales of size. Instead of breaking under stress like something brittle, these systems yield as if they were soft. Some parts respond quickly to the shock, allowing slower parts to ignore the shock and maintain their steady duties of system continuity. Consider the differently paced components to be layers. Each layer is functionally different from the others and operates somewhat independently, but each layer influences and responds to the layers closest to it in a way that makes the whole system resilient. Fast learns, slow remembers. Fast proposes, slow disposes. Fast is discontinuous, slow is continuous. Fast and small instructs slow and big by accrued innovation and by occasional revolution. Slow and big controls small and fast by constraint and constancy. Fast gets all our attention, slow has all the power. All durable dynamic systems have this sort of structure. It is what makes them adaptable and robust. Take a coniferous forest. The hierarchy in scale of pine needle, tree crown, patch, stand, whole forest, and biome is also a time hierarchy. The needle changes within a year, the crown over several years, the patch over many decades, the stand over a couple of centuries, the forest over a thousand years, and the biome over ten thousand years. The range of what the needle may do is constrained by the crown, which is constrained by the patch and stand, which are controlled by the forest, which is controlled by the biome. Nevertheless, innovation percolates throughout the system via evolutionary competition among lineages of individual trees dealing with the stresses of crowding, parasites, predation, and weather. Occasionally, large shocks such as fire or disease or human predation can suddenly upset the whole system, sometimes all the way down to the biome level. The destiny of our species is shaped by the imperatives of survival on six distinct time scales. To survive means to compete successfully on all six time scales. But the unit of survival is different at each of the six time scales. On a time scale of years, the unit is the individual. On a time scale of decades, the unit is the family. On a time scale of centuries, the unit is the tribe or nation. On a time scale of millennia, the unit is the culture. On a time scale of tens of millennia, the unit is the species. On a time scale of eons, the unit is the whole web of life on our planet. Every human being is the product of adaptation to the demands of all six time scales. That is why conflicting loyalties are deep in our nature. In order to survive, we have needed to be loyal to ourselves, to our families, to our tribes, to our cultures, to our species, to our planet. If our psychological impulses are complicated, it is because they were shaped by complicated and conflicting demands. Freeman Dyson, From Eros to Gaia, New York, Pantheon, 1992. p. 341. In terms of quantity, there are a great many pine needles and a great many humans, many forests and nations, only a few biomes and cultures, and but one planet. The hierarchy also underlies much of causation and explanation. On any subject, ask a four-year-old's sequence of annoying "Why? "s five times and you get to deep structure. "Why are you married, Mommy?" "That's how you make a family." "Why make a family?" "It's the only way people have found to civilize children." "Why civilize children?" "If we didn't, the world would be nothing but nasty gangs." "Why?" "Because gangs can't make farms and cities and universities." "Why not?" "Because they don't care about anything larger than themselves." The order of a healthy civilization. The fast layers innovate; the slow layers stabilize. The whole combines learning with continuity. In a durable society, each level is allowed to operate at its own pace, safely sustained by the slower levels below and kept invigorated by the livelier levels above. "Every form of civilization is a wise equilibrium between firm substructure and soaring liberty," wrote the historian Eugen Rosenstock-Huessy. Eugen Rosenstock-Huessy, Out of Revolution, Norwich, VT; Argo 1938, 1969. p. 563. Each layer must respect the different pace of the others. If commerce, for example, is allowed by governance and culture to push nature at a commercial pace, then all-supporting natural forests, fisheries, and aquifers will be lost. If governance is changed suddenly instead of gradually, you get the catastrophic French and Russian revolutions. In the Soviet Union, governance tried to ignore the constraints of culture and nature while forcing a five-year-plan infrastructure pace on commerce and art. Thus cutting itself off from both support and innovation, it was doomed. We can examine the array layer by layer, working down from the fast and attention-getting to the slow and powerful. Note that as people get older, their interests tend to migrate to the slower parts of the continuum. Culture is invisible to adolescents but a matter of great concern to elders. Adolescents are obsessed with fashion while elders are bored by it. The job of fashion and art is to be froth—quick, irrelevant, engaging, self-preoccupied, and cruel. Try this! No, no, try this! It is culture cut free to experiment as creatively and irresponsibly as the society can bear. From all that variety comes driving energy for commerce (the annual model change in automobiles) and the occasional good idea or practice that sifts down to improve deeper levels, such as governance becoming responsive to opinion polls, or culture gradually accepting "multiculturalism" as structure instead of just entertainment. If commerce is completely unfettered and unsupported by watchful governance and culture, it easily becomes crime, as in some nations after Communism fell. Likewise, commerce may instruct but must not control the levels below it, because it's too short-sighted. One of the stresses of our time is the way commerce is being accelerated by global markets and the digital and network revolutions. The proper role of commerce is to both exploit and absorb those shocks, passing some of the velocity and wealth on to the development of new infrastructure, but respecting the deeper rhythms of governance and culture. Infrastructure, essential as it is, can't be justified in strictly commercial terms. The payback period for things such as transportation and communication systems is too long for standard investment, so you get government-guaranteed instruments like bonds or government-guaranteed monopolies. Governance and culture have to be willing to take on the huge costs and prolonged disruption of constructing sewer systems, roads, and communication systems, all the while bearing in mind the health of even slower "natural" infrastructure—water, climate, etc. Education is intellectual infrastructure. So is science. They have very high yield, but delayed payback. Hasty societies that can't span those delays will lose out over time to societies that can. On the other hand, cultures too hidebound to allow education to advance at infrastructural pace also lose out. In the realm of governance, the most interesting trend in current times—besides the worldwide proliferation of democracy and the rule of law——is the rise of what is coming to be called the "social sector." The public sector is government, the private sector is business, and the social sector is the nongovernmental, nonprofit do-good organizations. Supported by philanthropy and the toil of volunteers, they range from church charities, local land trusts, and disease support groups to global players like the International Red Cross and World Wildlife Fund. What they have in common is that they serve the larger, slower good. The social sector acts on culture-level concerns in the domain of governance. One example is the sudden mid-20th-century dominance of "historic preservation" of buildings, pushed by organizations like the National Trust for Historic Preservation in America and English Heritage and the National Trust in Britain. Through them, culture declared that it was okay to change clothing at fashion pace, but not buildings; okay to change tenants at commercial pace, but not buildings; okay to change transportation at infrastructure pace, but not neighborhoods. "If some parts of our society are going to speed up," the organizations seemed to say, "then other parts are going to have to slow way down, just to keep balance." Even New York City, once the most demolition-driven metropolis in America, now is preserving its downtown. Culture's vast slow-motion dance keeps century and millennium time. Slower than political and economic history, it moves at the pace of language and religion. Culture is the work of whole peoples. In Asia you surrender to culture when you leave the city and hike back into the mountains, traveling back in time into remote village culture, where change is century-paced. In Europe you can see it in terminology, where the names of months (governance) have varied radically since 1500, but the names of signs of the Zodiac (culture) are unchanged in millennia. Europe’s most intractable wars have been religious wars. As for nature, its vast power, inexorable and implacable, just keeps surprising us. The world's first empire, the Akkadian in the Tigris-Euphrates valley, lasted only a hundred years, from 2300 BCE to 2200 BCE. It was wiped out by a drought that went on for three hundred years. Europe's first empire, the Minoan civilization, fell to earthquakes and a volcanic eruption in the 15th century BCE. When we disturb nature at its own scale, such as with our "extinction engine" and greenhouse gases, we risk triggering apocalyptic forces. Like it or not, we have to comprehend and engage the longest now of nature. The division of powers among the layers of civilization lets us relax about a few of our worries. We don't have to deplore technology and business changing rapidly while government controls, cultural mores, and "wisdom" change slowly. That's their job. 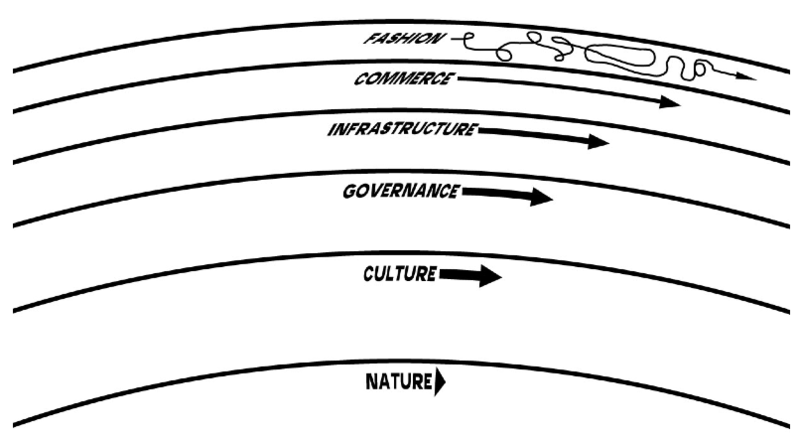 Also, we don't have to fear destabilizing positive-feedback loops (such as the Singularity) crashing the whole system. Such disruption can usually be isolated and absorbed. The total effect of the pace layers is that they provide a many-leveled corrective, stabilizing feedback throughout the system. It is precisely in the apparent contradictions between the pace layers that civilization finds its surest health. The idea of pace layering has a history. The text above is a slightly edited version of a chapter in my 1999 book The Clock of the Long Now: Time and Responsibility. I first created the healthy-civilization diagram with Brian Eno at his studio in London in ­­­­1996. Earlier still, in the early 1970s, the English architect Frank Duffy wrote, “A building properly conceived is several layers of longevity of built components.” He identified four layers in commercial buildings—Shell (lasts maybe 50 years), Services (swapped out every 15 years or so), Scenery (interior walls, etc. move every 5 to 7 years), and Set (furniture, moving sometimes monthly.) For my 1994 book How Buildings Learn: What Happens After They’re Built I expanded Duffy’s four layers to six: Site, Structure, Skin, Services, Space Plan, and Stuff. The chapter on how the components play out in a healthy building I titled “Shearing Layers.” Some reviewers of the book on Amazon claim that How Buildings Learn is really about software and systems design. 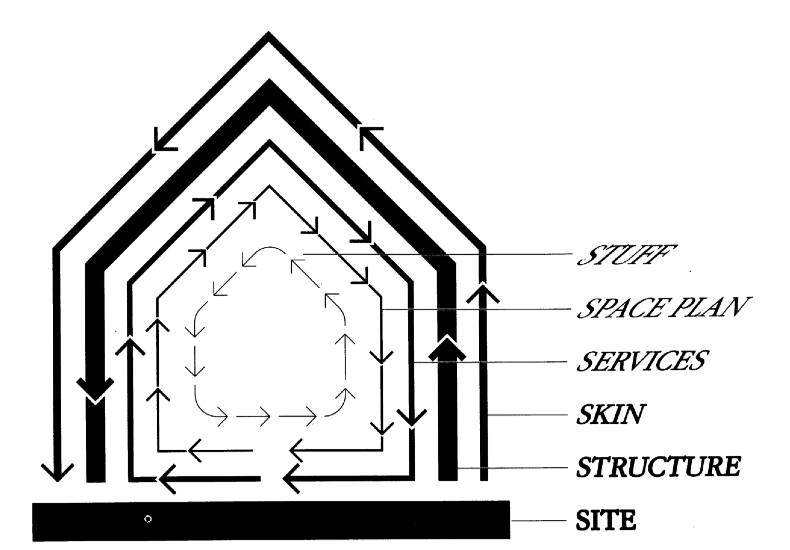 This is the diagram on which How Buildings Learn (1994) is based.